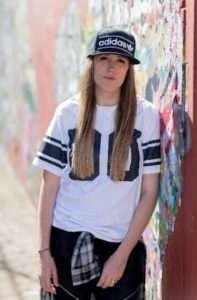 Kelly’s passion for Hip Hop began at the age of 7 while training with Pease Perfection and Centerville Contemporary Dance Studios. Inspired in the early ’90s by Aaliyah, Fatima and Janet Jackson, Kelly created the style that she has today. At age 9, Kelly began competing as a jazz and hip hop soloist, as well as a member of hip hop, jazz, tap and lyrical teams. Kelly founded and directed the Dayton Hip-Hop Collective and was a member of Fusion Cr3w. Kelly has taught Master Hip Hop classes in Ohio including Illmovez, and has choreographed for Cutting Edge Dance Studio and Centerville Contemporary Ballet. She has been a dance in-structor for 14 years, most recently with Howard School of Dance prior to opening the Funk Lab. In 2008, Kelly founded the Neverquit Dance Crew, where she was the artistic director and lead choreographer. Many of her pieces were given top awards at competitions. In 2009, Kelly organized and delivered the first Annual Dayton Hip Hop Showcase, which is now successful in its 10th year. Kelly has trained under Dave Scott, Wade Robson, Mia Michaels, Cris Judd, Jamal Simms, Dionna Pridgeon, Trae Turner, Wilfredo Rivera, Laurieann Gibson, Brian Friedman, Buddha Stretch, Hok, Travis Wall, Luam Keflegy, Laura Edwards, Nappytabs, Twitch and Ivan Koumaev and trained at Lou Conte Dance Studio in Chicago and Broadway Dance Center in NYC. She is mostly self-taught in bgirling but received private training from Jacquie Skunda of the Mighty Zulu Kings Crew and took class from Ephrat Asherie at Broadway Dance Center in NYC. Kelly has twice attended the prestigious Dance Teacher Summit in NYC where she has taken course on owning and operating a dance studio. It has been there that she met and received advice from many influential dance profes-sionals including Fox’s “So You Think You Can Dance” Mandy Moore and jazz pioneer Luigi Faccuito. In 2011, Kelly opened the Funk Lab Dance and Creative Arts Center where she is currently the owner and choreog-raphy and crew director. She also enjoys teaching at the recreational level. Kelly has been awarded numerous teacher excellence and choreography awards at various competition circuits. In 2012, Kelly was interviewed by Pilgrim Studios in North Hollywood for a reality series and invited to be a dancer in a popstar’s comeback album. In 2014, Her routine, Losing My Edge, won the prestigious Encore Award at Masquer-ade Dance Competition. Kelly has been interviewed by Huffington Post, PBS, Kettering Neighbors Magazine and Dance Teacher Magazine for her role as owner at Funk Lab Dance Center. Kelly has been interviewed by numerous media outlets in the area for her role in creating a positive hip hop dance experience for Dayton’s youth. This includes Dayton Daily News, Kettering-Oakwood Times, Dayton’s CW, WDTN Living Dayton, Dayton Most Metro, and Inclusion Magazine. She was interviewed by two radio shows and has presented at 2 Pecha Kucha events as well as been on panel for the Girl Scouts. Kelly has a son Liam and daughter Phoenix. Kelly is a board-certified psychiatric nurse and holds a Bachelor’s De-gree in Nursing from Wright State University.